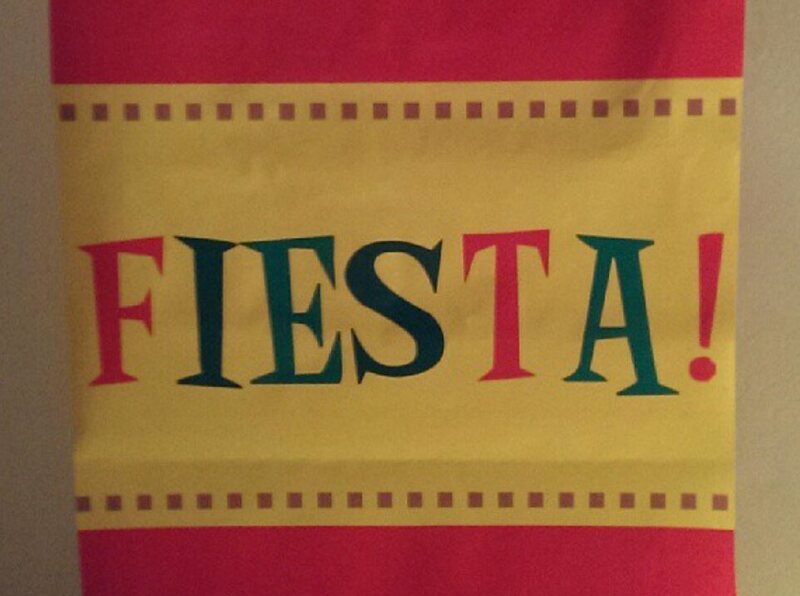 Buckle up people and prepare yourselves for a taste sensation that will give your taste buds their own private Mexican shindig this Summer! You all know already just how much I love Mexican cuisine, and I am always trying to invent new ways to enjoy the flavours of mexico, out side the traditional wrap & taco circle. 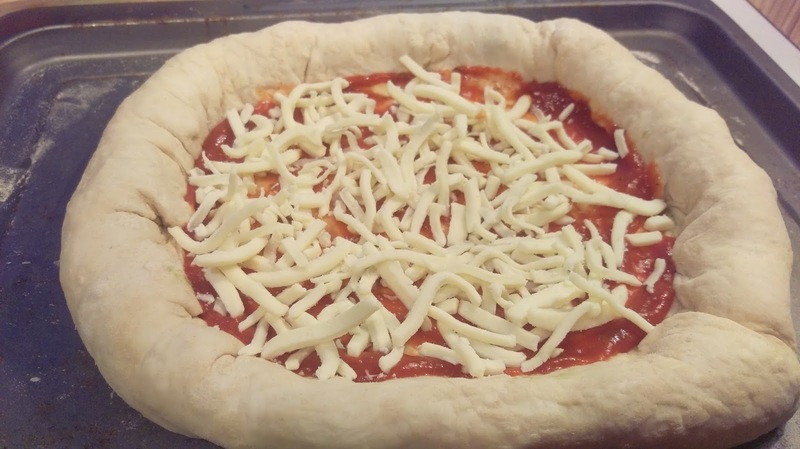 When I saw the pizza challenge with www.directstoves.com I thought immediately it was the perfect opportunity to trial something I have been dreaming of for a while, yes I dream of recipes, don’t you? you must be the weird one! teehee. Much to my own disappointment the trial only lasted one attempt because it worked so well first time around. It was spicy, creamy, crunchy, crisp and tasted super fresh, all the elements you could possibly wish for in a pizza. The colours in this pizza alone just give me that summery feeling. I look forward to Summer, don’t we all! 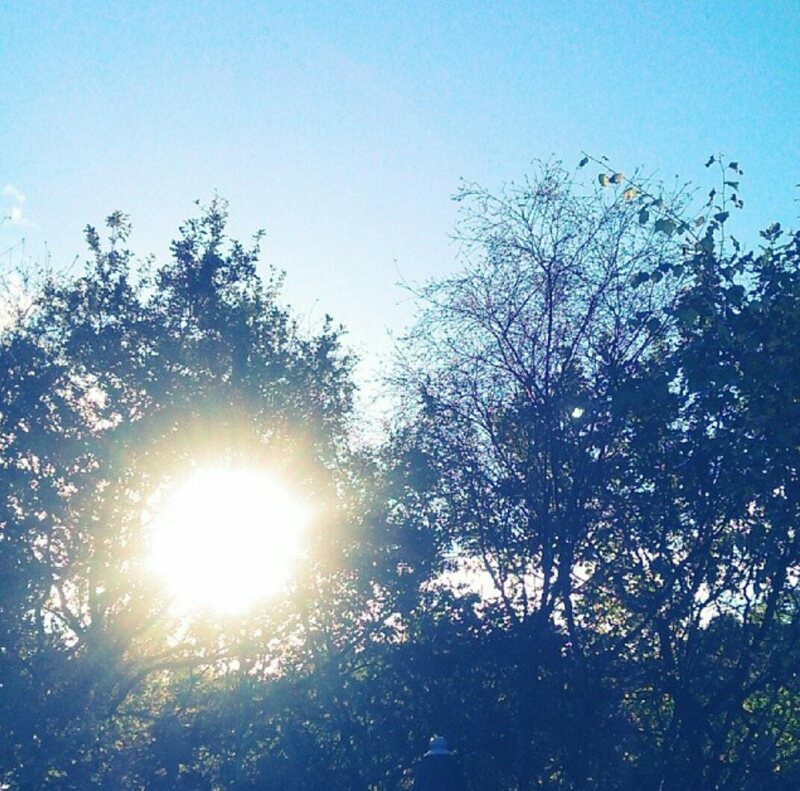 when that ball of yellow in the sky pops out and says “hey!” for a few hours extra each day, it makes all the difference to everyday life. 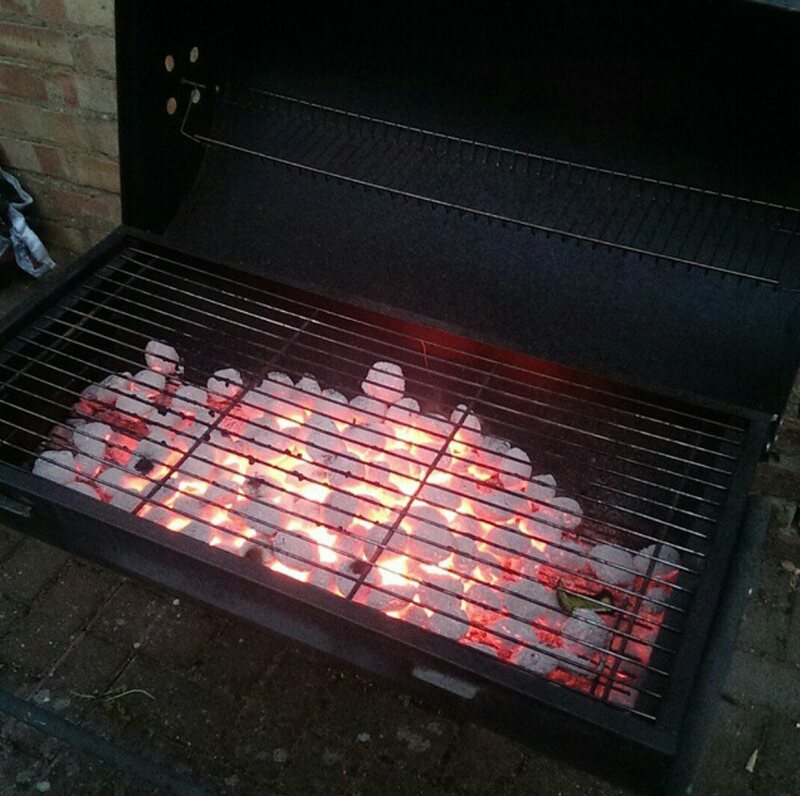 To be able to enjoy the long Summer evenings outdoors is my favourite thing. 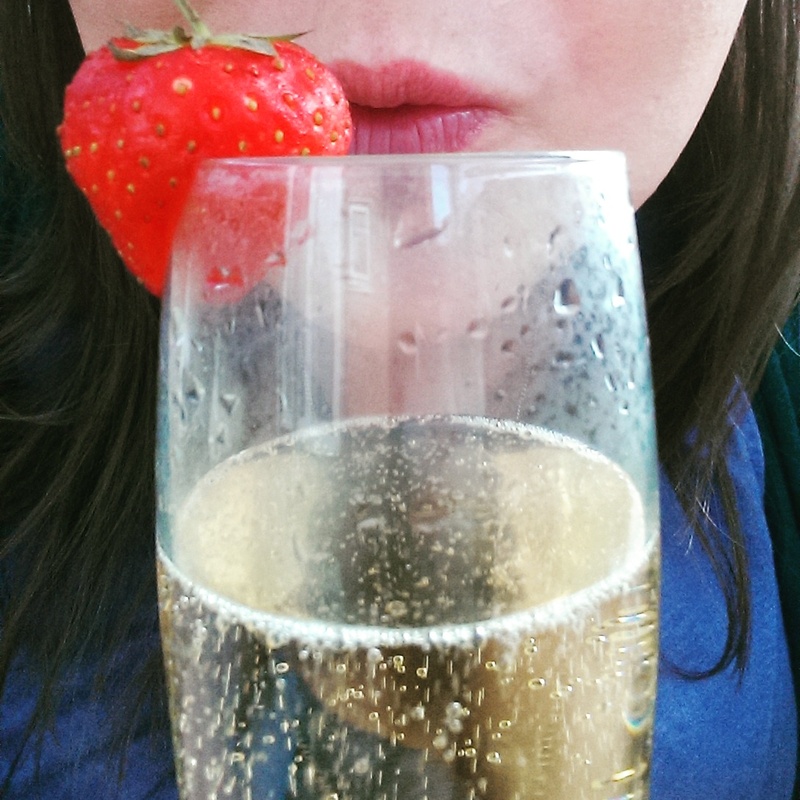 Gatherings in the garden, the smell of the BBQ being lit, the sound of music flowing from inside, my feet up, mojito in hand, maybe even a glass of chilled prosecco ……arr ok OK…I have quite a few favourite things in Summer. You get the idea! 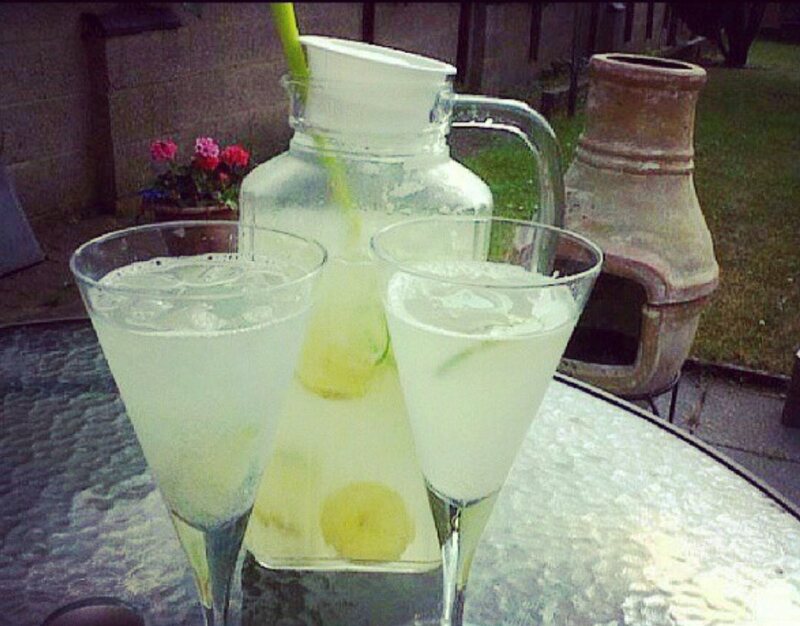 I LOVE SUMMER! ……traditional soft and fluffy pizza dough that encases creamy delicious avocado inside it’s deep golden crust. Home made tomato sauce with a sprinkling of fragrant herbs, covered with a soft quilt of mozzarella. Juicy spiced free range chicken breast layered on top with a delicate array of colourful juicy peppers. 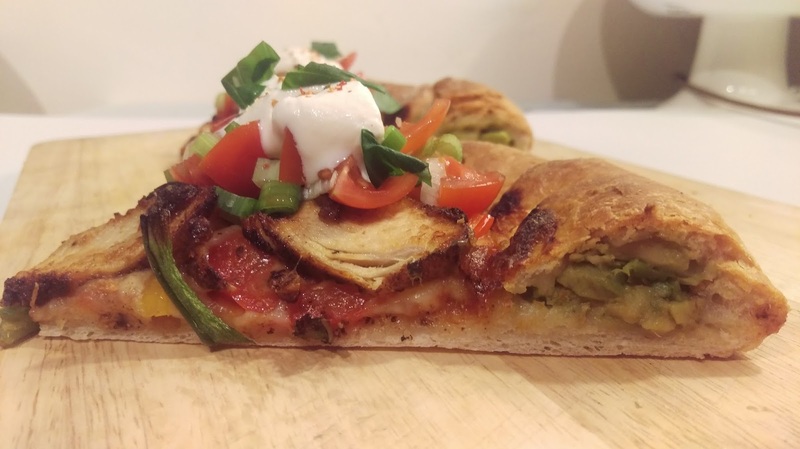 Served with crunchy crisp salsa and the calm and cooling tone of soured cream…….this isn’t just any old pizza, this is a Guacamole Stuffed Crust Fajita Pizza, made by Lynz……. OK, I’m done now. Heads up…here comes the recipe! 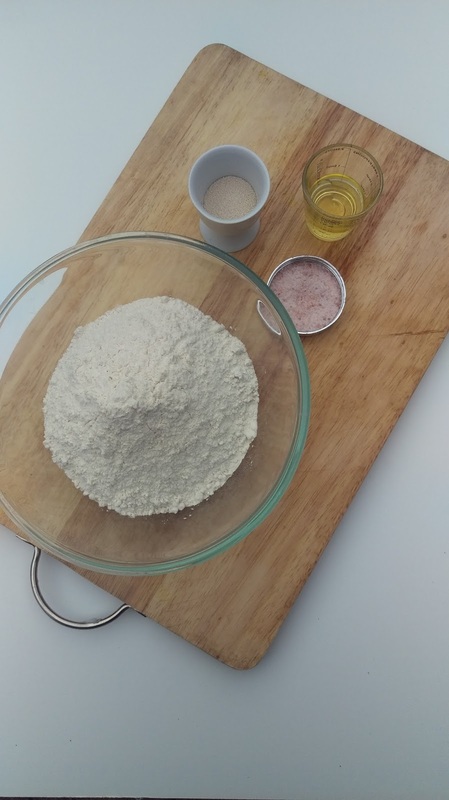 – In a bowl mix the flour, yeast and salt together. Make a well in the middle and pour in the warm water and olive oil. Bring together with a wooden spoon, it will be a soft and slightly wet dough. Turn out onto a lightly floured surface and knead for 4-5 mins until dough is smooth. Cover with a tea towel and set aside whilst you prepare the toppings. – In a bowl mix passata, basil and oregano together. Set aside. – Cut the avocados in half and take out the stone. Use a spoon and scoop out the avocado flesh into a bowl. Squeeze the lime juice over the avocado and season with salt & pepper. Set aside. – Coat the chicken breast with the fajita spice. Cook in a frying pan on a medium heat in a little oil, until cooked through. This should take roughly 6-8 mins. Once cooked, slice and set aside. 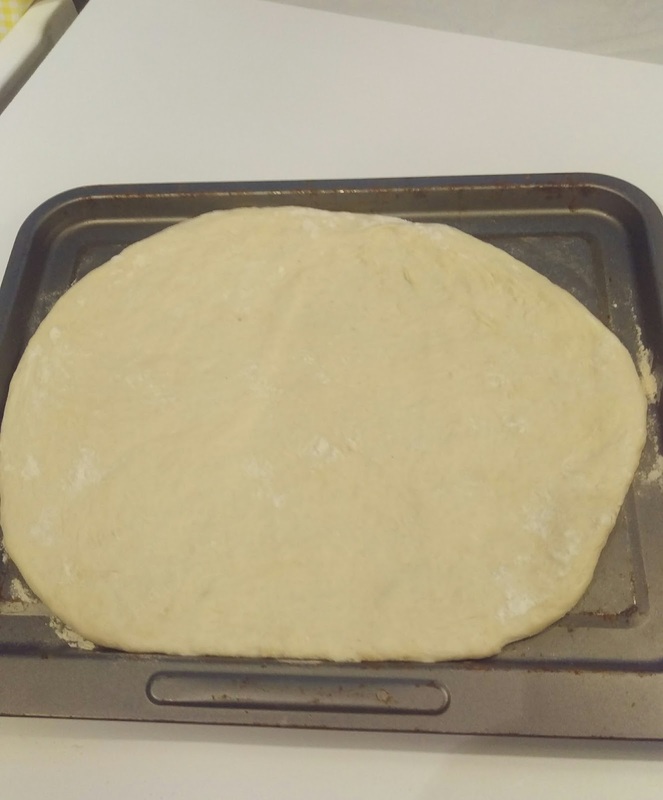 – On a lightly floured, large baking try, roll out the dough into a large circle until about 1 cm thick. – Spoon the guacamole around the outside of the dough, leaving a 3 cm space from the edge. 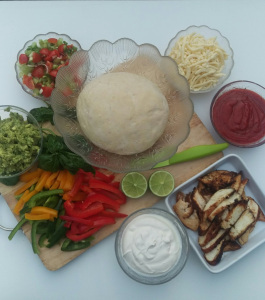 – Working your way around the dough, fold over the edge of the dough, covering the guacamole. 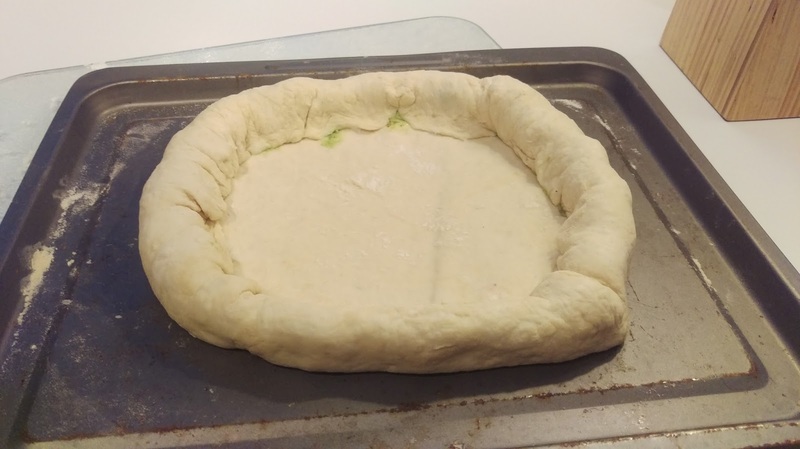 – Where the dough joins together, push it tightly together to seal. – Smother the tomato sauce over the base. – Scatter the mozzarella evenly over the sauce. 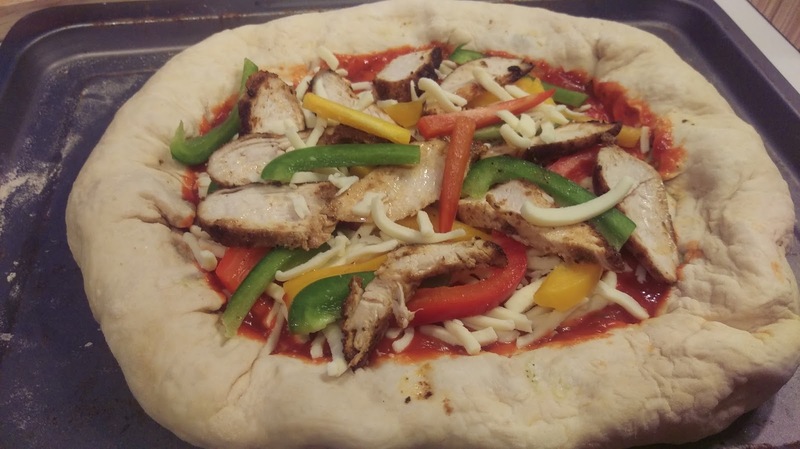 – Lay the peppers, onions and chicken on top. – Bake in the oven for 20mins or until crust is golden brown and base is crisp. – Slice pizza, top with salsa, soured cream and some fresh basil! I reckon I definitely need to trial another one soon, veeeery soon. In fact NOW! bye! OMgosh. This sounds (and looks) delicious. 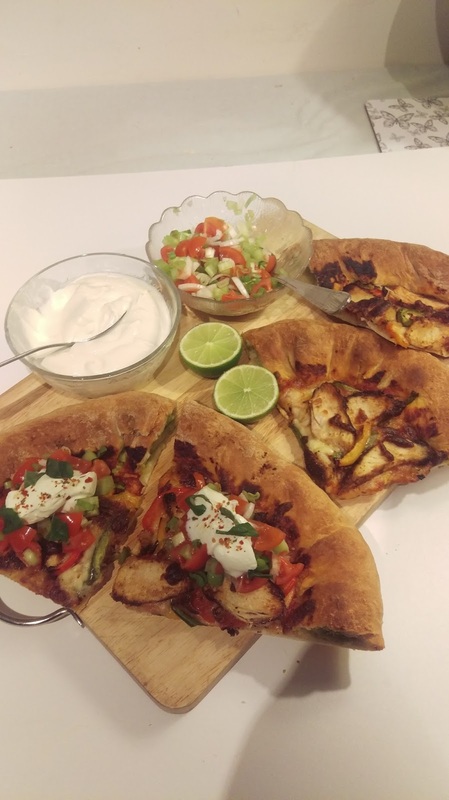 I love fajitas and never thought about making a pizza like this! I LOVE PIZZA! But I love making pizzas even more! 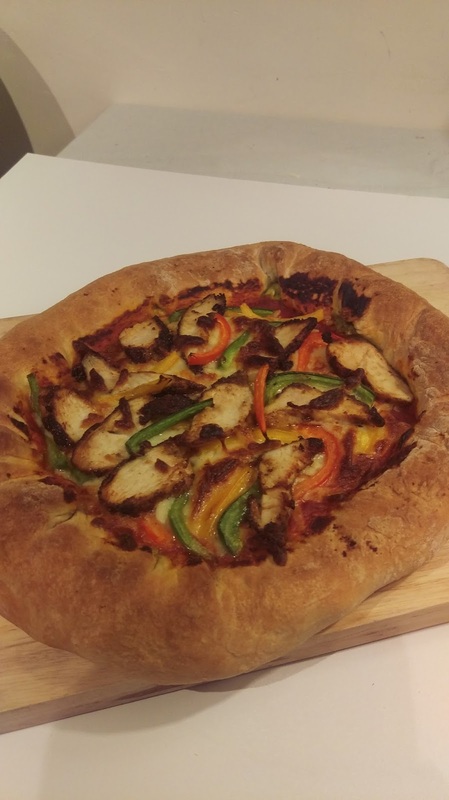 I have yet to try a stuffed crust pizza but will definitely try it out now using your recipe as inspiration :-). 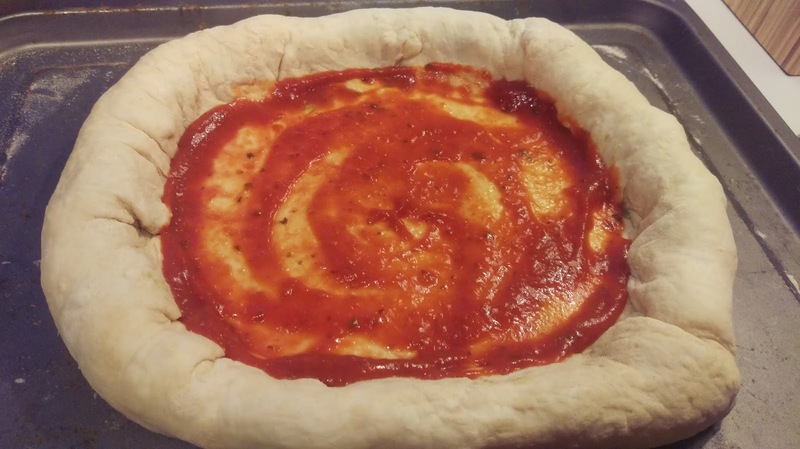 I also have a pizza dough recipe that is easy and foolproof. And I totally believe that homemade is best! Woah! What a pizza. That looks amazing. Certainly hearty, as well! 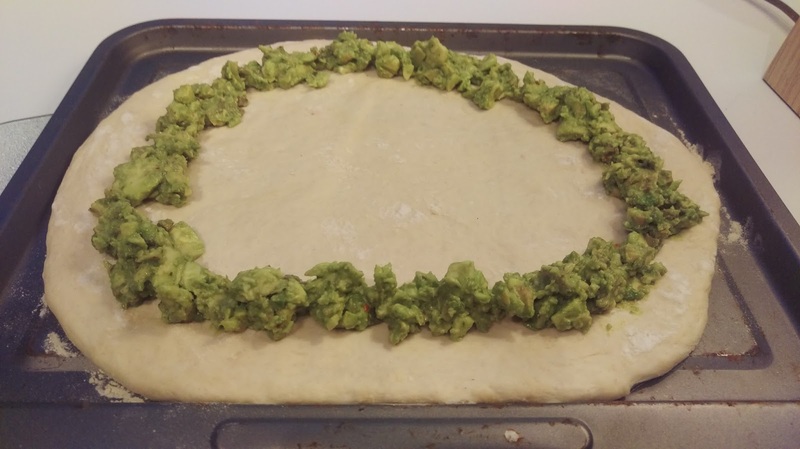 My husband would enjoy the guacamole-stuffed crust.